I’ve had it with those in public or otherwise positions of power and influence referring to the rest of us as “the Small people, “the Little People” or the “common man” or the “common people” or even the “regular people”. All this kind of careless and arrogant language smacks of disrespect and elitism. The British Petroleum Chairman stated that “we care about the small people.” This is apparently to say that he is not of the “small people”, being more than or bigger than “small people” and presumably… others? Who exactly are not “the little people”? Did he really mean this? Is it really true? It has been common that those seeking political office in our country, including presidential candidates have referred to US citizens – voters and taxpayers – as “everyday people”, or the “common workers” or other such descriptions. All these various titles are offensive to me. Don’t they understand, if nothing else, that even just from an understanding of common language, that with such labels they essentially identify themselves as “uncommon”, something beyond “just regular”, the “big people”? They effectively make themselves out to be those who are beyond “everyday” in stature and status. And they don’t even know they’re saying it… or do they? President George W. Bush was quoted as speaking of “the common people”. President Obama has referred to us as “working class people.” And the truth is innumerable similar quotes can be found made by many politicians and business people everywhere. To be sure, such comments are not meant to be derogatory, but there is something misguided if not arrogant about them. The nasty, dark side note to this fact is that while everyone wants to be financially wealthy – we crave it, in fact, or are envious, even jealous of it – once you get there, you’re the bad guy, to be mistrusted and despised. How hypocritical? 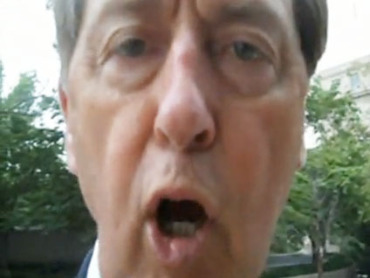 And how about the outrageous behavior of North Carolina Representative Bob Etheridge this week? Where did that come from? Grabbing a young man, an interviewer who identified himself as a student when the individual questioned him on the street over several political issues of the day, Etheridge seemed to act from some place where it’s as if he is above such interaction; as if he doesn’t have to take this from such a person. Really? For all Etheridge knew, that kid may have been the very one who cast the final vote that put him in office to represent that kid’s interests. How does he know? He doesn’t. He just knows he doesn’t want to be questioned. Almost as if he is above it. Watching the scene play out repeatedly on television, I was almost waiting for a defiant question back from Etheridge: “Don’t you know who I am? !” It’s as if he was saying, “You can’t question me like that!” He didn’t say it, but I heard it. Arrogance at its best. So actually, I have had it with both extremes: Too many on the top look down at the rest of us, and too many on the bottom, while they want to be on top, think those who are already there are somehow evil, to be demonized. Enough already. Have we forgotten about the goodness and nobility in striving for the financial part of the American dream? Again regarding those of position, one might think that at the very point of when and where it is most crucial to be thoughtful and sensitive to those who will decide their fates – such as when addressing people who have had their lives turned upside down in the course of a catastrophic event – they would be that much more careful with their words and actions. But no, it seems that’s the way they think; it’s what they believe; their world view is cut from a better cloth. It seems it’s where they actually live, in mind, body, and status. Some past leaders in United States history stepped out of – or more correctly – stepped down from – their high places, places authorized, created, appointed, and given by others, to truly mix on an even plain, if even just for a moment; perhaps a timely and critical moment, to mix and mingle. To speak with and relate to, and understand and really listen to those very ones who made it all possible. 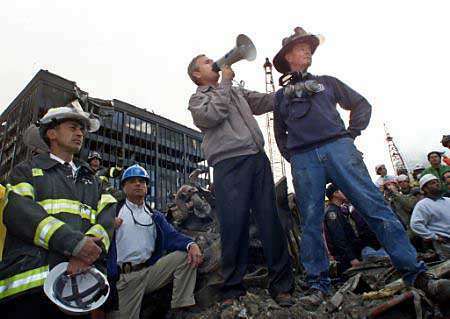 Recall when President George W. Bush stood atop the pile of World Trade Center rubble in New York speaking on behalf of an entire nation through a bullhorn, surrounded all those “ordinary” people, “…the ones who do all the living and dying…” (To quote George Bailey.) We knew he was with us; he was one of us. Consider President Andrew Jackson who opened the White House (for better or worse) to All the People. Sure, it made for a chaotic environment, including broken dishes and windows, the masses riotously flooding the “People’s House” to ravage it’s otherwise hallowed halls. But the President recognized his position and place. Perhaps it was only possible in such a simpler, safer, even more naive time. We have evolved to be sure. But the understanding Jackson displayed was and still is of great value. Thomas Jefferson had warned against all sorts of insidious threats to the citizenry committed by those in power. He’s the one who believed that “a little rebellion now and then is a good thing,” knowing that those in positions of power will tend to abuse the privilege. And it’s an additional problem if they don’t believe it’s a privilege, but a right. In politics – at least in American politics – it is the voters, choosing freely and without fear who they believe ought to lead on their behalf, reserving the right and privilege to remove and replace those elected leaders if they fail them. The power remains with the people – at least in theory. In business (ideally), the individuals who achieve the highest levels of leadership and influence have done so by their own personal merits, but also enabled by the intangible gifts given by many others around them, like family and friends: love, encouragement, teaching, influence, guidance, and advice, among other important contributing factors. But so often, those who are in places of authority, leadership or otherwise powerful positions of influence – such as the Chairman and the CEO of BP – give the strongest impression they live on a separate and not equal plane. One might be tempted to blame it solely on an old and tiresome arrogance born of hundreds of years of the British and European cultures of aristocracy. And would this be to say that it’s not actually their fault (as individuals)? Rather it’s the culture? I think not. Sure, perhaps there is some degree of truth to it. But what about personal discretion, self awareness and self control? What about one’s personal ability to be thoughtful and decent to others? If nothing else, it proves arrogance is a universal human trait worth dropping. How about a little moderation – and consideration – in all things? Whatever the origins or reasons, I don’t care. People who speak in this way to us ought to step down from their self-perceived pedestals and go back to a so-called “regular” life, to get a proper immersion in the real, “common” world. 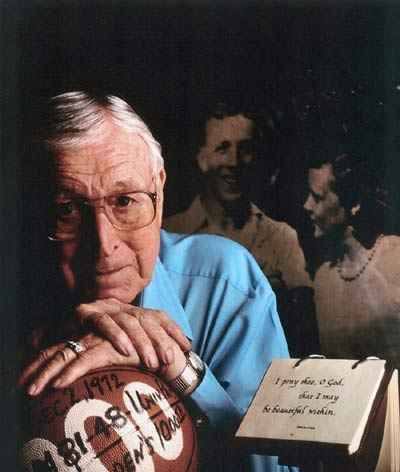 There is no doubt John Wooden was the direct source of Indiana’s reputation as the basketball state. I think it is right to consider him the Father of Indiana basketball, and aside of Dr. Naismith, the game’s inventor, the greatest name in all of basketball. 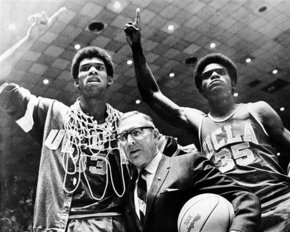 He was known nationwide by generations as “Coach Wooden of UCLA”, and the world-over as the greatest coach in any sport, perhaps any profession, of all-time. But he was most uncomfortable with any of these descriptions and titles. He was a coach, and before that, a player. He was humble. Perhaps it was precisely the combination of these characteristics that made him a great man in the eyes of anyone who knew him or was touched by him in some way. And his reach – his touch – went far beyond basketball. To try to say more about what he was – the roles he played, every descriptive word to try to do justice to his quality and the quality of his life, would really be inadequate and unnecessary. When he spoke of the most important things of life, principles to live by, maxims to remember, a philosophy to be guided by, he reached out for two things: his faith and his Indiana roots. We Hoosiers know where he came from. And he never forgot, and he never let anyone else forget. With regard to his faith, it was, specifically, the Bible. With regard to his Indiana roots, it was specifically, his father. Perhaps it is a time to read the words, thoughts, and wisdom of a great and humble man.